Fill water 2-3 inches up a deep 12-inch non-stick or stainless steel skillet. The skillet needs to be wide and deep enough so the eggs have plenty of room to cook without over crowding. Set on high heat. Add kosher salt and vinegar and bring to a gentle boil. Turn the heat down to medium to maintain a gentle simmer. Crack eggs into separate small bowls. Then dish or ladle each one gently , down close, into the water keeping the egg in tact. Give each egg plenty of room. The vinegar helps the egg stay together and not "feather" or spread out too much. Do not touch, fiddle with the eggs, or move water around. Let simmer for 3-5 minutes. 3 minutes for a more soft egg and 5 minutes for a medium soft egg. Use a slotted spoon to scoop out each egg. Place carefully on a paper towel to soak up the excess water and dry. 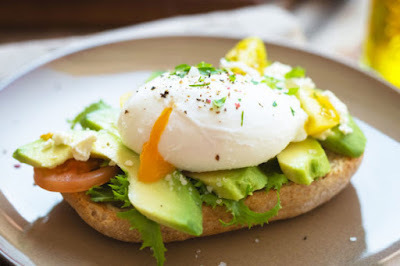 Construct your breakfast, place your poached egg and serve immediately.